For my final recipe this week I wanted something a little different to finish the mini series off. 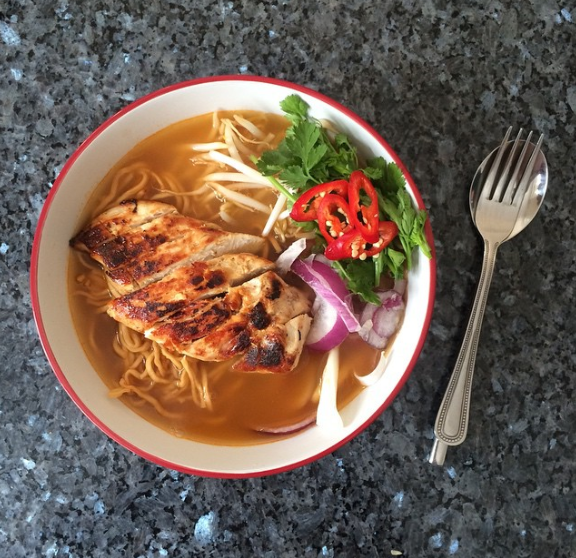 I thought I’d recreate one of my all time favourite dishes from Wagamama – Spicy Chicken Ramen. 1. In a deep pan, add the stock into a pan and raise to the boil. Add the chilli powder, tomato puree, soy sauce and lemon juice. Leave for 5 minutes. 2. Meanwhile, fry two chicken breasts and sprinkle with salt and pepper. 3. While your stock is simmering and chicken breasts are frying, prepare two deep serving bowls with raw onion and been spouts to one side of the dish. 4. When your chicken breasts are almost done, add the noodles into the broth and cook for 5 minutes. 5. When the chicken is cooked through, slice into thin pieces. Spoon the noodles into the bowl then pour the stock over them until the onions, noodles and bean sprouts are covered. 6. Place the chicken breast on top, add the garnish and serve. Hope you have all enjoyed Food Week on The G Edit.